Who said that I must write reviews exclusively for the latest releases?! This will be the first of a new series of reviews where I’ll try to give the spotlight to some older albums. Since I’ll first write a long premise about Hifuu arranges, if you want to skip to the main focus of this post just go under the picture or ctrl+f “asdrubale”. Remember the times when arranges of ZUN’s music collection were pretty rare and it was a nice surprise to find an album with Renko and Maribel on the cover? Okay, now I feel like I’m starting to talk like a nostalgic hag “back in my day there was superior music and the Neo Super-Express arrived on time!! !11”… But back when I started to listen Touhou arranges (2010) and I was browsing random music, mostly anything that wasn’t an arrange of the Windows games managed to stand out. This also included any original from ZUN’s albums. Though I was much more into PC-98 themes and the few Seihou that wasn’t that freaking Yuuka theme. It was around 2012 that I became an Hifuu fangirl, when I started to follow BUTAOTOME and also thanks to echo Project’s “Mary had a little love”. From there, I started to check out various arranges and I’ve also discovered many artists. But something happened in 2013. I remember Reitaisai 10 was the very first event with a large amount of Hifuu albums and songs. And the number kept growing event after event. 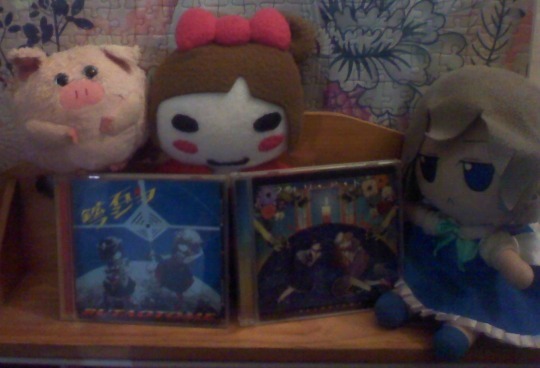 At first I was very enthusiast about the spam, but during 2014 I started to become very annoyed, due to the release of some bad quality albums, but luckily BUTAOTOME (and Liz Triangle) revived this love. I could say Hifuu Club can be considered its own thing, like a sort of spin-off series to Touhou. The two small Touhou events solely dedicated to Hifuus are also quite popular in the music deparment (at least compared with other events dedicated to one character or game). Probably it also helps that this duo of outsiders has potentially more music themes than every other character: while ZUN only confirmed Girls’ Sealing Club as theme of the Hifuu Club, Merry the Magician as Merry’s theme and Strange Bird of the Moon Illusion of Mysterious Cat as Renko and Merry’s theme, the fandom pretty much associates every original track in ZUN’s albums to them, with Greenwich in the Sky being Renko’s (unofficial) theme. Some circles also throw Dolls in Pseudo Paradise tracks in the mix, but since that album has a completely unrelated story, those tunes are generally not very popular. I challenge you to find a Touhou circle who never arranged something from Renko and Merry’s series: I can actually name a few, but most of them are inactive names. I think Hifuu fan music pretty much lost the charm that made it stand out at the beginning, but I still happily check out various arranges and I have some favourites among the new stuff. I would love more Sumireko and less generic RenMerry relationship, though. “In 2019, Touhou Project won’t exist anymore. Instead, it will be referred to as Hifuu.” Jordi, 2017. Asdrubale! Now, let’s start with Kouseki Radio. One of the first things we notice is that the album has 12 tracks!!! Oh wait. It’s a misprint, probably a leftover of a Nekokenban graphic. It actually has 4 vocal tracks framed by 3 instrumentals, for a total of 7 songs. The predominant graphics are the colors red and blue and radio artworks. There is also a small homage to Neil Armstrong, the first man on the moon, who died a couple of weeks before the release of this album. Each track is named after a gemstone and we can also find artworks of them in the booklet. The Sis loves gemstones and I remember she posted a lot of pics from her collection on Twitter during the time of this album’s making and release. I don’t know if the gems can be related to the songs, or if they simply picked up some cool names from Sis’ collection (without using the obvious choices like ruby, sapphire, emerald, etc.). Only Moonstone directly appears in its lyrics, as “tsuki no ishi”, 月の石 and the stone can be linked to Renko and her ability. This is also the last album to date to feature Ranko no Ane’s lyrics. There was a common misconception in the English fandom that the bunny was also in charge of writing every BUTAOTOME lyrics. I don’t know where it originated from (maybe because someone particularly praised them or because she wrote Gensou no Satellite), but her lyrics were a staple element up until Tasogare Elegy, and for most of those albums they weren’t even half of the total tracks. Then she wrote a compilation track in 2011, some tracks in 2012 and nothing more. It’s pretty much 5% of the entire BUTAOTOME track catalogue. A pianica arrange of Girls Hihifuu Club opens the album. It has also some radio sounds in the intro and the outro, which we also find at the end of each track of this album, to symbolize one of its themes. The most popular track from this album, probably because it’s pretty much the “brighter” sounding one and it’s also a sort of key track. Even though it was played live kinda often, Ranko commented a couple of times that it’s one of the hardest songs for her, probably due to the long notes in the refrains. It’s good overall and if you are a fan of the song, I suggest to check out its acoustic version on Acoustic Gakkyokushuu! The Gensokyo That Floats in Outer Space has always been my least favourite Hifuu theme ever, also thanks to a certain Sally song. But despite that, this is a nice and kinda acoustic tune that becomes more lively in the refrains. The most upbeat track is this instrumental interlude. It’s a fun track where Paprika and Comp are jamming and the solo parts are wonderful. “I will marry whoever will make an Izanagi Object arrange, but I don’t think Butaotome will ever make one.” Me, August 2012. It’s amazing how this track was made in two-three weeks, if you consider that Neo-traditionalism of Japan was released one month before the release of this album. Anyway, this is my favourite track of the album! It’s a more guitar-driven piece which also manages to have a dark mood. To end the main part of this album, a piece that uses acoustic guitar, piano and percussion. Ranko’s vocals sound more sweet and I really like its overall atmosphere. Substantially the same song of prologue. A sudden interference closes the album. Kouseki Radio is a nice album, but I also think it’s one of those albums that works better as it is instead of picking the best singles: personally, I really like the little details that emphatize its unifying themes. I recommend it to those who want something not really upbeat and with a bit of melancholy or simply to Hifuu funz. The vocals tracks also work really well for acoustic re-arrangements, I’m glad they got all played back in the Golden Age of BUTAOTOME Livestream, when Ranko was there: you can watch one of these performances at the bottom of the post! Now, to Folie à deux. This album has only 3 elements in common with the previous album: it’s a full-Hifuu disc, it has 4 vocal tracks + 3 instrumentals and the fourth track is in the same style. Everything else is vastly different. Running steps, the sound of a door opening and closing and finally a triumphiant orchestral arrangement of Green Sanatorium opens this album. To start the main part of this album, a straightforward orchestral piece with Ranko’s vocals. I imagined this track being played live with real orchestral instruments (perhaps for an Hifuu-only one man live) and holy sheep, it would be wonderful. I know it’s pretty much impossible, but dreaming is fun and free. It continues with the classical sounds that are in almost every track. This is the happiest sounding one and makes me imagine Renko happily wandering in the small world of the album. A small highlight are the parts before the refrain, where Ranko sings one syllable at time, together with the piano playing. My favourite track of the album. A beautiful and tragic waltz-inspired number, supported by the accordion, the piano playing of the original theme and Ranko’s sorrowful tones. And now, here is a kinda typical song. This originated from EX-Eientei’s Senshuuraku, a Hifuu compilation centered on happy and bad endings, more precisely from the “bad end side”. It makes me wonder if the album concept was already in mind since April/May 2014 or BUTAOTOME just decided to put it in the album because it’s cool. Even though there is “folie à deux mix” next to its title, the original version is just the same. It’s a rock track, but there is a desperate feeling in it. It would fit as ending theme for an Hifuu anime. If you think it sounds weird or out of place in the album, I suggest to check out the rearranged version on FREAKS! Again, pretty much the same thing of the intro track. Then suddenly the door opens and closes and we can also hear footsteps as the music continues in background. What happened? Folie à deux is one of my favourite Touhou releases and is still my favourite of the Hifuu-only releases from BUTAOTOME. I’ve very attached to it and I’m also a sucker of orchestral influences, so I would recommend it to those who love the genre… or simply to Hifuu funz (lol). To tie-in with the ending concept that was in Namida Tojikometa, I like to think this was a sort of ending for BUTAOTOME’s Hifuu saga (if there was any… lol). Coincidentially, 2015 was also the release of Urban Legend in Limbo, which introduced Sumireko Usami and marked a new beginning (also in temporal sense) for the official Hifuu series. That’s all for this post! By the way, here is the review I wrote for FREAKS back when it was released, just for the sake of completition!